A 6-inch e-book reader with a monochrome Carta E-ink display with a built-in light. It comes with 4GB of memory. It uses touchscreen navigation and has WiFi for buying e-books. 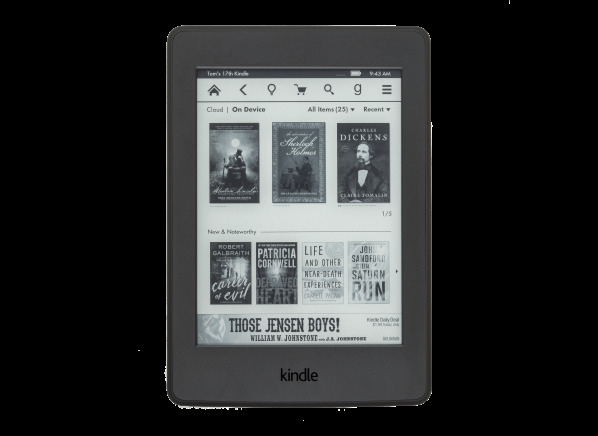 The Amazon Kindle Paperwhite w/ Special Offers (WiFi) (3rd Gen) is a 6-inch e-book reader with a monochrome Carta E-ink display with a built-in light. It comes with 4GB of memory. It uses touchscreen navigation. It has 802.11n WiFi for buying ebooks and surfing the web. The Kindle Paperwhite w/ Special Offers (WiFi) (3rd Gen) measures 6.7 inches high by 4.6 inches wide by 0.4 inches thick and weighs 7.2 ounces. It comes with a 12-month warranty on parts and labor. Removable memory type Removable memory type The format for the removable memory medium used in the e-book reader. Among the most common are Secure Digital (SD) and Memory Stick (MS). You must get the correct type of storage for your e-book reader; check with the manufacturer or retailer if you're uncertain. Number of memory card slots Number of memory card slots How many separate memory card slots an e-book reader has. Power connector Power connector Indicates if the e-book reader has a separate connector for a power adapter. Headphone jack Headphone jack When you want to listen to an audiobook, have an e-book read to you, or listen to music without disturbing others, a headphone jack lets you plug in headphones so you alone hear the sound. E-book store E-book store Lists e-book stores that the e-book reader can access and directly buy e-books from. Library loaning Library loaning Indicates if the reader can read any of the e-book formats available from public libraries. They are typically DRM (Digital Rights Management) protected EPUB, Adobe PDF, Amazon AZW, and Mobipocket formats. Unsecured e-book formats Unsecured e-book formats Lists e-book formats with no DRM (Digital Rights Management) the e-book reader supports. Those formats are Adobe PDF, Audible Enhanced (AAX), Audible (AA), BBeB Book (LRF, LRS, LRX), EPUB, FictionBook (FB2), Microsoft Reader (LIT), Mobipocket unprotected books (MOBI, PRC), and Rocket e-book (rb). DRM e-book formats DRM e-book formats Lists e-book formats with DRM (Digital Rights Management) the e-book reader supports. Those formats are Adobe PDF, Amazon (AZW), EPUB, and Mobipocket (MOBI, PRC). Other document formats Other document formats Lists other e-book and document types the e-book reader supports. Those formats are rich text format (RTF), text (TXT), Word 2003 and previous (DOC) and Word 2007 (DOCX). Notes stay with e-book Notes stay with e-book Whether or not your annotations and notes stay with the e-book either attached to your account at an e-book store or with the e-book file. You can see all your annotations if you switch devices or move the e-book's file. Clippings stay with e-book Clippings stay with e-book Clippings are highlighted pieces of text (just a few words or whole paragraphs or chapters) that you want to save. Whether or not your annotations and notes stay with the e-book either attached to your account at an e-book store or with the e-book file. You can see all your annotations if you switch devices or move the e-book's file. WiFi WiFi Most e-book readers have a built-in WiFi radio that allows them to download e-books and access the Internet via home networks and WiFi hotspots. WiFi- is the name for a medium-range (150 feet) wireless connectivity standard, officially known as IEEE 802.11. WiFi enables secure networking of many electronic devices. 802.11n is the most common type found in e-book readers. It is backwards compatible with 802.11g and 802.11b. Cellular 3G Cellular 3G 3rd generation cellular broadband data connection. Some e-book readers use a 3G data connection to download e-books directly from an e-book store over the air. A cell phone service provider has to enable this capability and typically there is no extra charge for this data service on e-book readers. 3G carrier 3G carrier This is the cell phone service provider that enables the 3G capabilities of those e-book readers that have it. Check in your area to see if you get 3G coverage from the e-book reader's cellular service provider or you may get very slow e-book download times or no over the air download capabilities at all. Internal memory (GB) Internal memory Also called onboard or built-in memory. The amount of internal memory to store e-books, music and photos that comes with the e-book reader. Some e-book readers have additional memory slots into which removable media such as Secure Digital and Memory Stick cards can be inserted to expand storage capacity. Music formats Music formats Lists music file formats the e-book reader supports. Those formats are AAC, MP3, WAV, and WMA. Photo formats Photo formats Lists photo file formats the e-book reader supports. Those formats are BMP, GIF, JPEG, PNG and TIFF. Text-to-speech Text-to-speech Text-to-speech will read a regular e-book aloud over the e-book reader's speaker or through its headphone. It uses a computer simulated voice. This is not to be confused with an audiobook which is a recording of a live person that is played back similar to a music file being played. Height (in.) Height The e-book reader's height, measured to the nearest tenth of an inch, and listed the way the e-book reader would be oriented if you were holding a book. Width (in.) Width The e-book reader's width, measured to the nearest tenth of an inch, and listed the way the e-book reader would be oriented if you were holding a book. Depth (in.) Depth The e-book reader's depth, measured to the nearest tenth of an inch. Weight (oz.) Weight How much the e-book reader weighs in ounces, including batteries but not including accessories. For models with no internal memory, the memory card is included. Warranty -- parts Warranty -- parts The length of time in months the reader's parts are covered by its manufacturer for defects. Warranty -- labor Warranty -- labor The length of time in months the reader's labor is covered by its manufacturer.